Even if you live in a city apartment, you can still have your own garden. 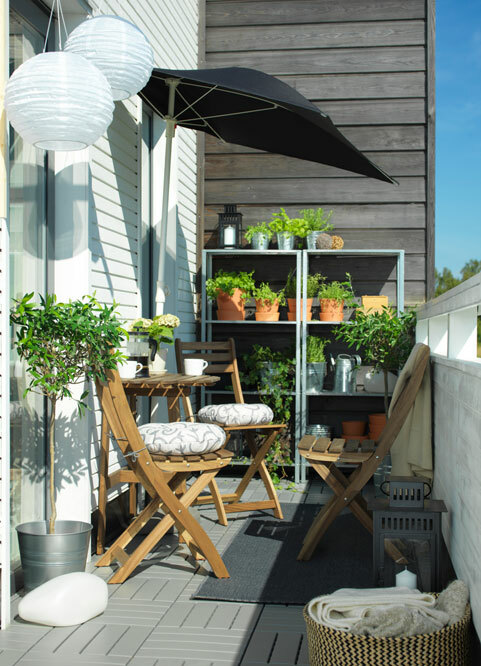 All you need is a balcony, HINDÖ shelving units made of steel, and TÄRNÖ outdoor furniture. The chairs and the table take little room to store as they fold flat. So there is always enough space for your pots and plants. 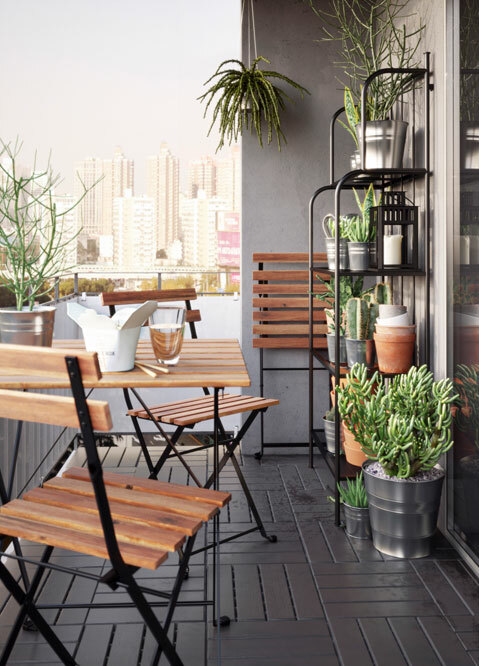 How to furnish a balcony to make room for both your beloved plants and cosy conversations? This modern style balcony in a couple's apartment has all it takes: from large plant pots to a small coffee table to a pair of stylish (and easy to keep clean) PS VAGO outdoor chairs on the RUNNEN floor decking. They look fresher and last longer, as the plastic is both fade resistant and UV stabilised to prevent cracking and drying out. The chairs can also be stacked, which helps you save space. What do you need to attract more visitors to your outdoor cafe? 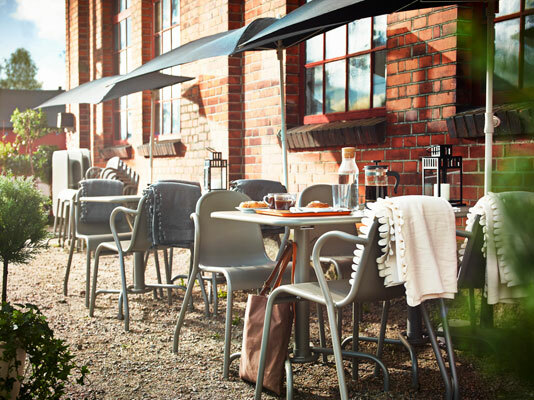 Make it nice and cosy with TUNHOLMEN outdoor furniture. The tables and chairs are sturdy, lightweight and maintenance-free, as they are made of rustproof aluminium. The tables stand steady on an uneven floor since they have adjustable feet. There also are some hooks under the table top for hanging the bags. After a busy day, when your cafe is closed, the furniture takes little room to store as the tables fold flat and the chairs are stackable. An inviting terrace next to a family house is perfect for dining outside. One of the reasons to spend more time in fresh air is a set of durable yet lightweight and easy to keep clean outdoor furniture. The set is big enough for the whole family. It includes a HODDE outdoor rug, two SJÄLLAND chairs, an outdoor table with a hole in the middle that keeps your parasol in place, and a bench. If your apartment has a roomy balcony, use it as a place for family leisure. For that, you might need the SALTHOLMEN outdoor furniture: both the table and the chairs fold flat, so they take little room to store. 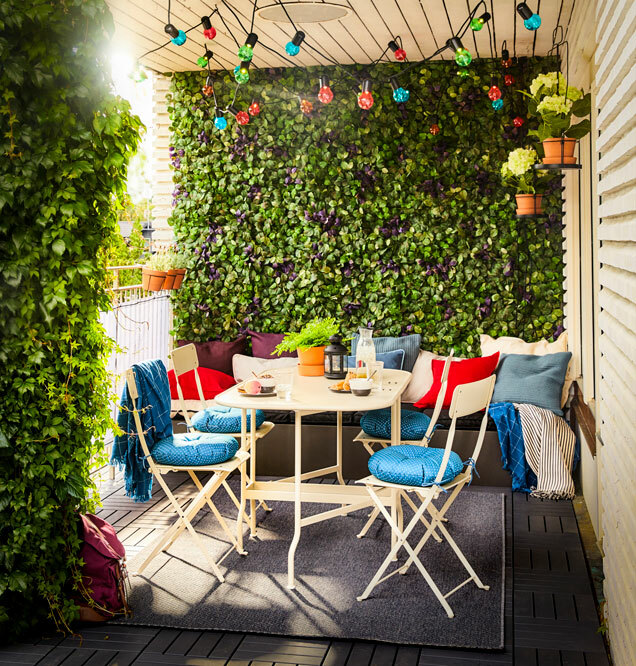 Use FEJKA artificial plant panels if you want to have more greenery, or colourful lighting chains and outdoor cushions to make the balcony cosy and cheerful. How to furnish a small balcony? 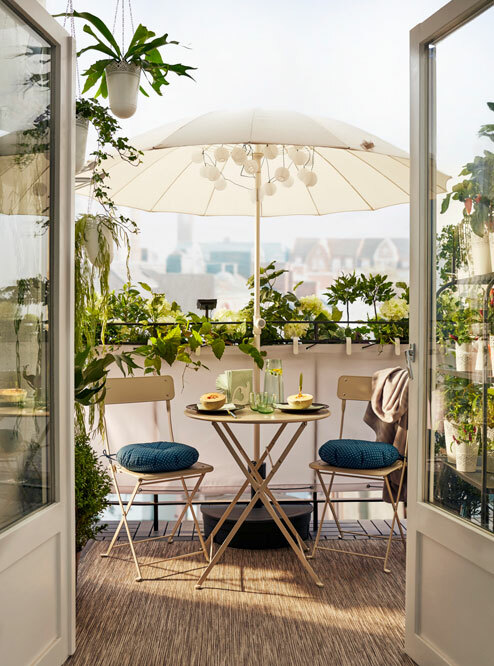 Having a small-space balcony doesn't mean you cannot have a nice oasis for two. In this balcony, there is enough room for a full outdoor furniture set. The SALTHOLMEN table and folding chairs take little room to store as both fold flat. The hole in the middle of the table top keeps the parasol in place. 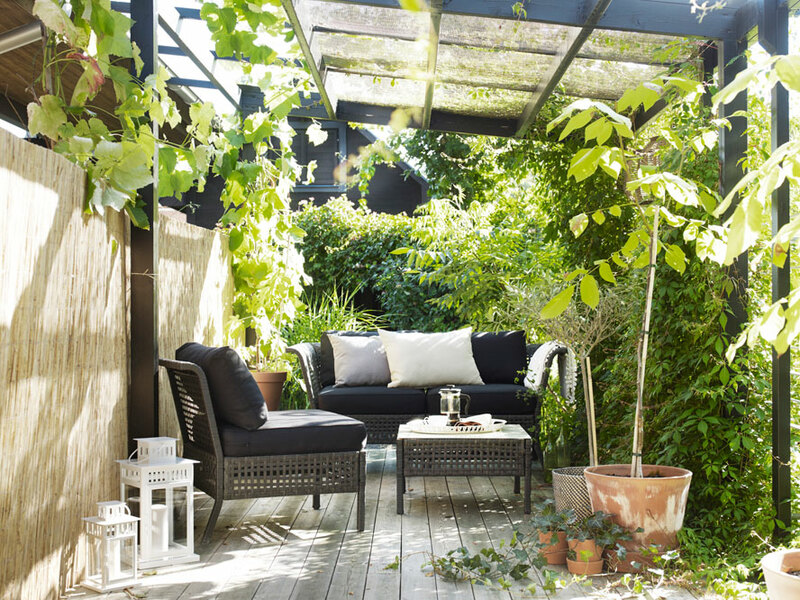 And if you want to bring more cosiness to this oasis, place a rug, hang some green plants or put soft cushions on the chairs. A small apartment with a small balcony and an enormous joy to have one! 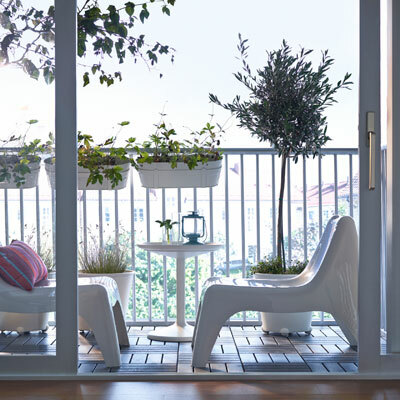 This cosy balcony belongs to an elderly couple and features the ASKHOLMEN outdoor furniture set. The wooden furniture has added durability as it has been pre-treated with a layer of semi-transparent wood stain. 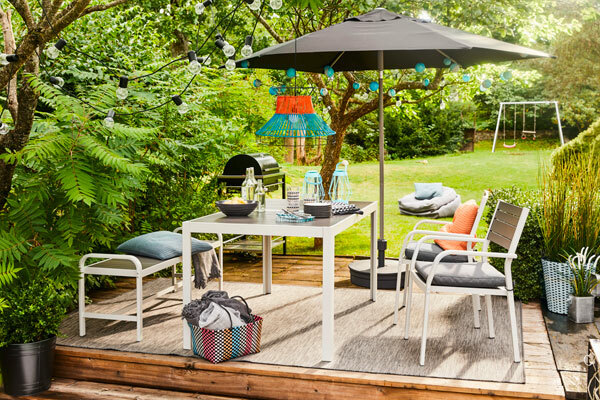 The soft outdoor cushions make sitting more comfortable, and the FLISÖ parasol gives very good protection against the sun. Sometimes you don't need much to give your balcony a totally new look. Bring some new colours with RUNNEN floor decking and TÄRNÖ outdoor furniture set. 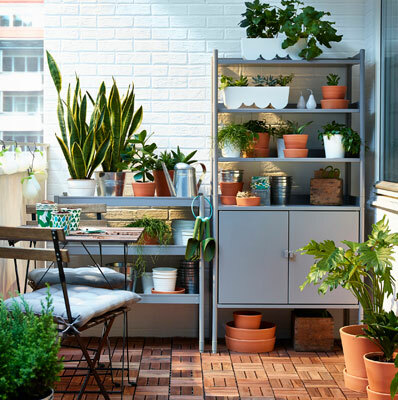 Add the LÄCKÖ outdoor shelving unit with pots and plants, and make more room in the balcony by folding the table and the chairs flat. Welcome to a winter garden filled with greenery and comfortable outdoor furniture. By combining different sections of KUNGSHOLMEN tables and sofas you can create a furniture set in a shape and size that perfectly suits your space. To make the sofa even more comfortable and personal, add decorative cushions in various sizes, colours and patterns with washable covers.